Organizations, individuals and a few celebrities are rallying for a piece of legislation that addresses the root of all companion animal problems - irresponsible pet guardianship. Ohio is the only state that discriminates against a type of dog: pit bull terriers and their perceived mixes. As soon as a pit bull terrier or a mix of pit bull terrier is born, he or she is automatically deemed "vicious" by the Buckeye state. Most counties won"t adopt out pit-bull-type dogs because of the state law, so that means the dogs are routinely killed in the shelter system. Lilo, pictured right, is available for adoption. Please click on her image for details. You can help save a life in Toledo by adopting this sweet girl! House Bill 14 is a thorough and comprehensive bill that would do away with the designation of pit bull terriers as vicious and put the power into the hands of the authorities. The bill would allow dog wardens to make determinations about and take action based on a dog"s behavior, not breed. "It would be a huge victory to repeal this designation," states Best Friends" senior legislative attorney Ledy VanKavage. Dogs should be judged by their behavior not their appearance." Preston, at right, is available for adoption in Toledo. Click on his image for details on making him a part of your family. Ledy knows a thing or two about breed-discriminatory laws and their unconscionable nature. She"s been lobbying for breed-neutral companion animal laws since 1987 and helped craft this bill that is targeted at public safety. 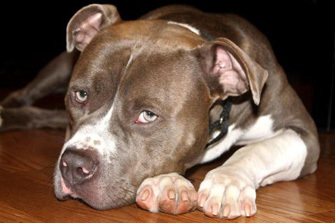 The dire treatment of pit-bull-type dogs in the state actually led to the formation of the Ohio Coalition of Dog Advocates. The founder, Jean Keating, is optimistic about HB 14 passing once and for all. "Basically we formed the coalition because we were all trying to do the same thing, remove the breed-discriminatory laws and replace them with laws that punish reckless dog owners," says Jean. "There are only a handful of people that are treating their dogs in ways that can create dangerous dogs, but that could be any dog, not just pit bulls. The laws now allow the authorities to take away family dogs while not giving them the tools to address the real dangers to our community - irresponsible owners." Jean credits Ledy and Best Friends for helping to craft and hopefully pass this public safety bill. HB 14 echoes the enlightened companion animal ordinances of Illinois, where authorities assess a dog"s behavior and do not act on bias. Jean says HB 14 has no major opposition, and why should it? It will completely change the way dog wardens do their jobs. It will give to them the tools needed to educate and assist the public, without sending wardens on a proverbial witch hunt. As Jean puts succinctly, "We owe so much to Ledy and Best Friends." She then shines a light on our favorite pit bull terrier mix muses, the Victory dogs: "What Best Friends has accomplished with the Vick dogs is amazing. Best Friends turned the tide for pit bulls everywhere by saving those dogs. They"re 40 dogs that saved them all! It could have failed or changed the way pit bulls are treated across the country." Luckily for us all, the latter has come to fruition. HB 14 has also gained the attention of some high-powered animal advocates around the nation. Willie Nelson (yes, that Willie!) sent a letter to support of HB 14. Actress Maggie Q made a PSA explaining the virtues of the bill, and actor Ian Somerhalder helped spread the word by blogging about it on his foundation"s website. 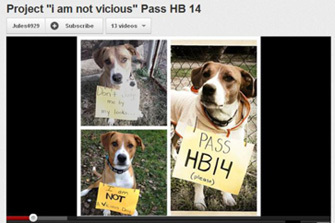 Click on the image at right to watch the video dedicated animal advocates created in support of HB 14! In a "lemons to lemonade" trick, the antiquated breed-discriminatory laws of Ohio have actually galvanized the animal-loving community to present a united front to pass protective companion animal laws. Like-minded folks are joining forces to get a puppy mill law and Nitro"s Law (an animal anti-cruelty law) passed. Check out the Ohio Coalition for Dog Advocates to learn about more ways you can get involved in making the state a better place for companion animals and the people who love them. Ohioans, please contact your senators to let them know you support HB 14. Click here for contact information. Sign the petition Ohio Legislators: Pass H.B. 14 to End Breed Discrimination.